Last week, Langchatters got (inter)personal! Participants considered how proficiency level affects interpersonal task design. Next, acknowledging that learner output is based on perceived need to produce language, they reflected on how to build a feeling of need into task design. Langchatters then discussed their thoughts on ideal group size and make-up for interpersonal tasks. They also talked about design of quality interpersonal writing tasks. Instructors ended the hour by sharing interpersonal tasks that they have designed and implemented successfully. Thanks to all who contributed to a strong interpersonal dynamic last week! We extend a big thanks to Laura (@SraSpanglish), Sara-Elizabeth (@SECottrell), and Kris (@KrisClimer) for moderating the Thursday evening chat, and to Colleen (@CoLeeSensei), “sipping coffee [and] leading [the Saturday morning Sequel] from west coast” (@SECottrell). Question 1: How does proficiency level affect interpersonal task design? Question 2: How can our tasks make students feel the need to produce output? Question 3: What are your thoughts on group size and make-up for interpersonal tasks? Participants reflected on the influence of group size and make-up on the quality of interpersonal activities. Here’s what they had to say! Group Size: @LisaShepard2 felt that pair work was best for novice students: “I prefer [two per group] for novices, [with] more opportunities to speak.” @MmeBurgess agreed that group size “depends on level,” adding, “[Lower] levels tend to need smaller groups. Otherwise, not everyone talks AND [it’s] too easy to digress.” @KrisClimer commented, “Pairs maximize the activity per participant, but teams of three or four can provide some comfortable space, too.” @MCoachSalato said, “My classroom is set up in groups of [three students] with a ‘leader’ in each. 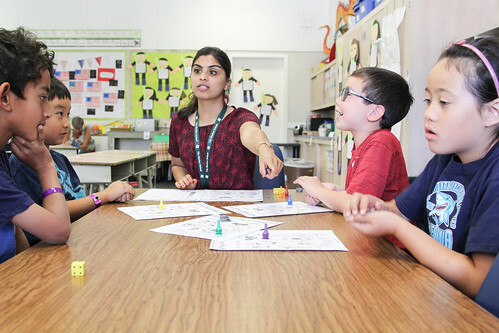 This [student] makes sure all [students] speak and do so in [the target language. This makes it easier for] me.” Participants discussed positive and negative aspects of larger groups. @MmeBlouwolff wrote about large groups favorably: “I like [one third] of the class [grouped together] at a time so [seven or eight students interact] at once. [Students] practice turn-taking [and] can take a breather when they need to.” On the other hand, @FrenchFunFacts pointed out that “the affective filter can be high for larger groups, [so] it may be good to be flexible for student preference.” @LauraErinParker added that not all students are active in larger groups. @Narralakes proposed a differentiated approach with flexible groupings based on level and task. Question 4: How can we design quality interpersonal writing tasks? Participants had similar suggestions for quality interpersonal writing tasks as they did for speaking tasks. We bring you their tips for making interpersonal writing meaningful! Audience design: @LisaShepard2 suggested that instructors provide students with an audience. She added that this need not be ‘authentic’ but can simply consist of classmates. @senornoble recommended penpals as an option. Question 5: What interpersonal tasks have you successfully designed and implemented in your classroom? Eyewitness accounts: @SECottrell wrote, “[Playing] eyewitness to a news event made for [a] good interaction for us.” Details here! Pop song discussions: @SraSpanglish said, “[Daily] pop song practice chats are going nicely, especially [with] emphasis on questions [and] PARTNER’s ideas.” More info here! Langchatters discussed how to design tasks for quality interpersonal interactions. They considered the influence of proficiency level on interpersonal task design, thought up ways to encourage learner output, and shared their thoughts on ideal group size and make-up for interpersonal tasks. They also chatted about how to design quality interpersonal writing tasks. Lastly, Langchatters offered up some of their successful interpersonal tasks. Throughout, participants reminded one another that small changes to task design can lead to big student output! Thank you to everyone who kept interpersonal engagement high on #langchat last week! Don’t forget that you can get your #langchat on twice a week now– both Thursday at 8 p.m. ET AND Saturday morning at 10 a.m. ET!